Have you dreamed of a new kitchen? One that is not only beautiful, but functional? This is the heart of what we do! Our clients love enjoying their new kitchens as much as we love creating them. There is nothing more satisfying to us than a final walk-through with a client and they talk about how much space they have and how efficient and functional it is to use. Check out some of our latest projects and the awesome storage solutions we have used to organize these work horses. First up is one of our favorites- Coffee Bars! Coffee has become the hot element in kitchens as of lately (in addition to home bars), and we love incorporating cool coffee stations into our projects. The kitchen above features a coffee and microwave cabinet. The pocket hardware allows for the doors to be tucked out the way when in use and closed up when the homeowner doesn't want to see the mess anymore! A perfect win win. The 7 to 7 Bar. This 7 to 7 bar is perfect for 7am coffee or a 7pm cocktail! 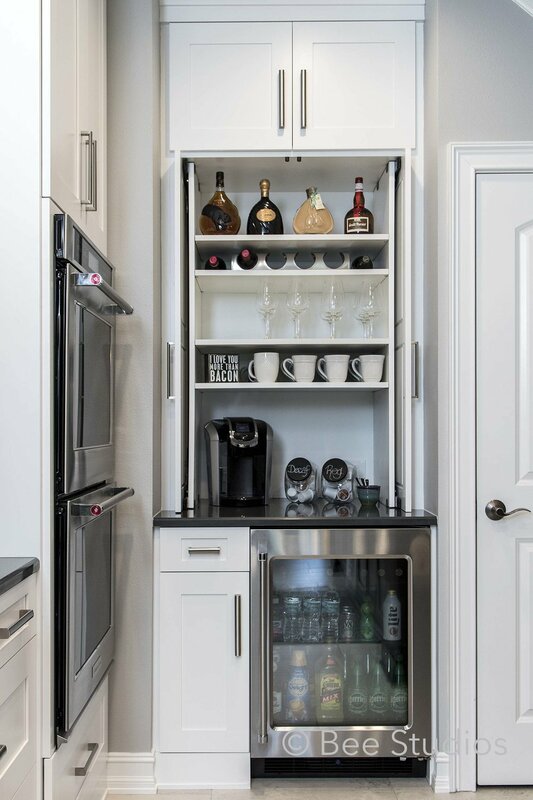 The bar fridge is a great place to store coffee creamers, mixers, and cold drinks for guests. 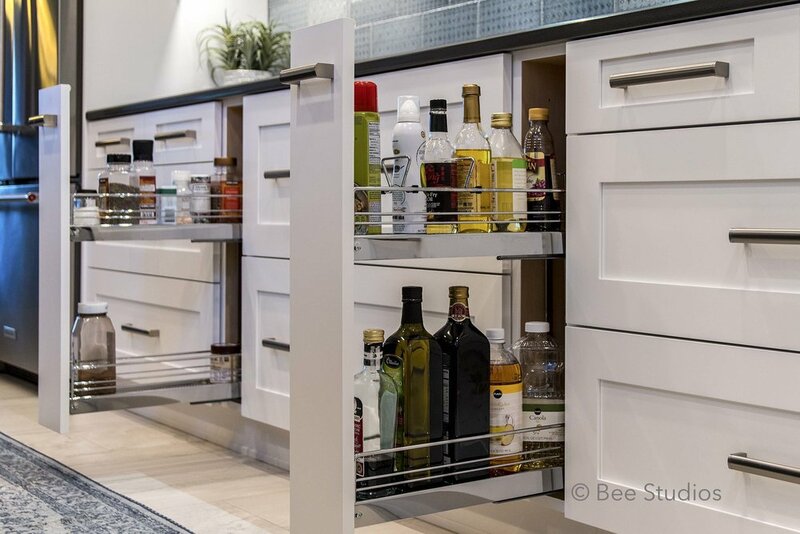 Narrow pullout units are perfect for small spaces that need to maximize every inch of storage. We can pack a lot into these little cabinets. The one above to the left, features a towel drying rack and shelf for soaps or cleaning supplies, a great option near a sink. The one above to the right, is only 6" wide and perfect for spices and oils near a cooktop or range. The shelves are adjustable, so the cabinet can grow with your shopping habits. One of our all time favorites- The Lemans Corner, or as I like to call it- the Magic Corner. 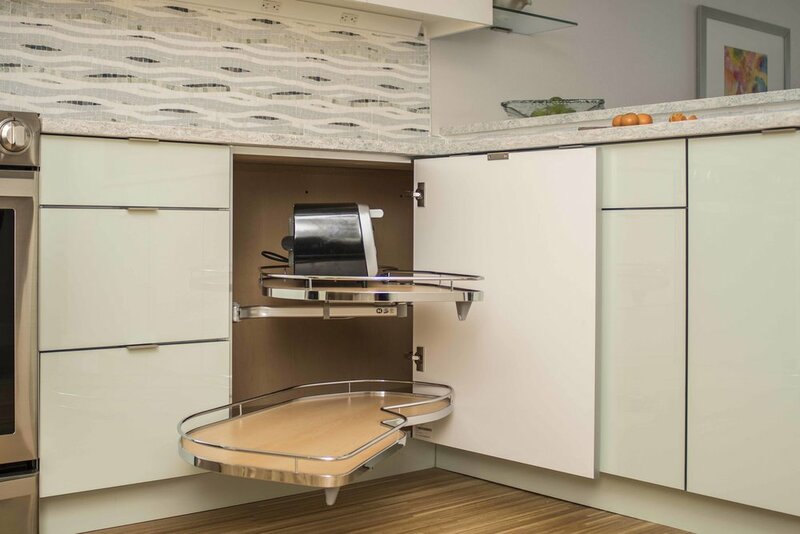 This unit turns an ordinary blind corner into a kitchen designers dream. These kidney shaped trays pull out fully into the kitchen so you can see everything you have stored. They are also on soft close, so they are easy on the ears when the trays close. 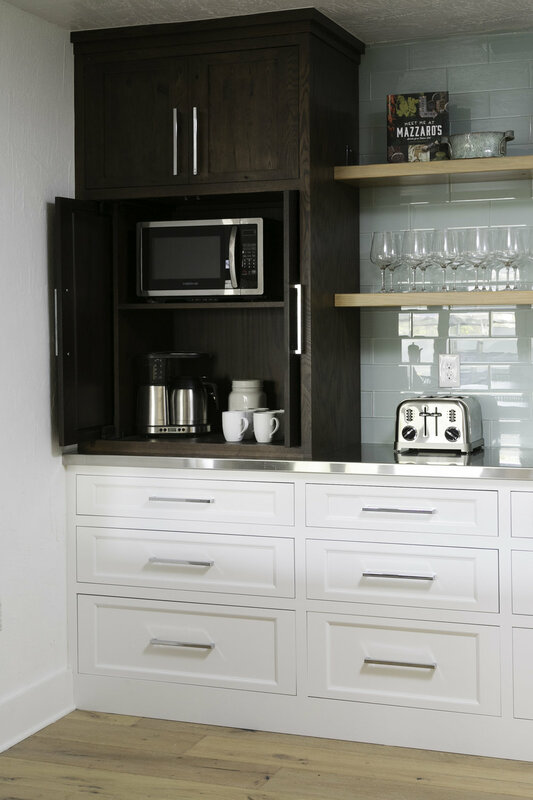 Working with a designer can ensure this cabinet can be utilized in your kitchen, there are tricky corner clearances to contend with, especially around appliances. And lastly, we are featuring drawer storage on a banquette or bench area. These are becoming more and more popular in kitchens as a way to incorporate casual in-kitchen eating areas. We design them a lot with drawers for bonus storage. This particular unit, the client requested the drawers to face out. Perfect for kids games or shoe storage by the door.